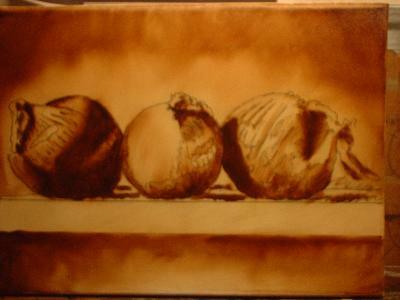 Still life onion, Part 2 of my Still Life demonstration from my Easel! 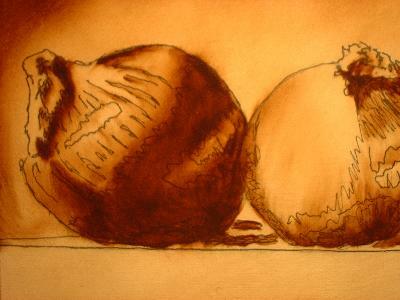 Here's a second part to a Still life onion, demonstration from my easel. 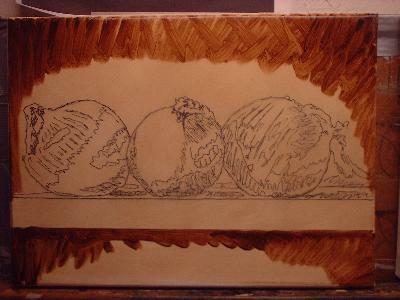 This is the umber under layer (or brown underpainting) that provides me of the total contrast of the painting. 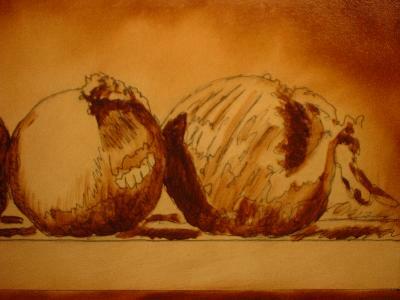 It also is the first step in establishing those wonderful half tones and shadows you'll complete in the dead, or gray layer. Now there are two ways this can be approached. 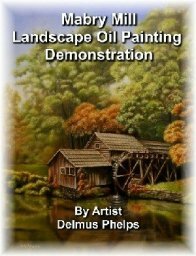 This part of the painting can be painted with a great amount of accuracy, or you can paint it with less details and make the entire painting really blurred or out of focus. In later layers you can then "tighten it up" or make things more focused. My recommendation is to follow like I have done here and make it pretty tight. 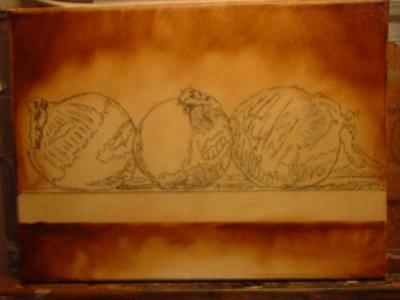 Later, as you learn the technique better, this layer can be more loosely done. 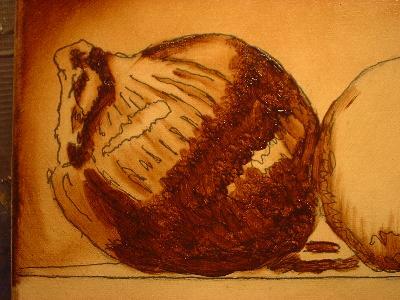 Below you see the application of the umber. Below you see the first correction/blending with a small dry mop brush. On the left you see the brush strokes. On the right is the smoothed out part with no brush strokes. Almost looking like a water color wash.
A photo further back after using the large dry mop brush to blend out all remaining brush strokes and soften the entire painting. 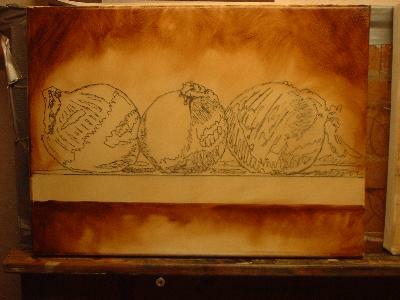 I'm applying the umber to the onion, this is a second coat as the first has been applied and blended. I'm wanting a darker shadow, thus re-application of paint that is thicker. On the other onions also. 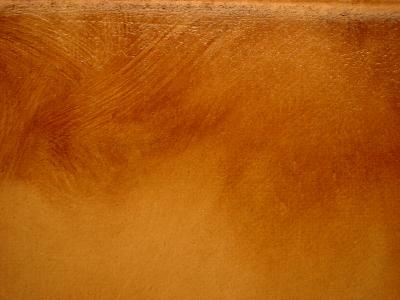 After blending this application of paint. After final blending with the large brush and now allowed to rest and dry. 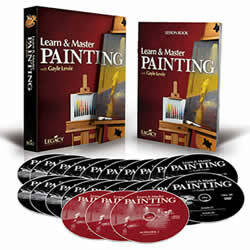 Subscribe to my RSS feed, and know when I've updated with my next lesson on the easel. I'll be including this painting and it's dead/gray layer, and will include some very close up photo's of the work. This has always helped me, and I'm sure it will help you! You can also subscribe to the E-Zine, which will inform you of any new pages that have been added to the website. It comes out every other month or so.